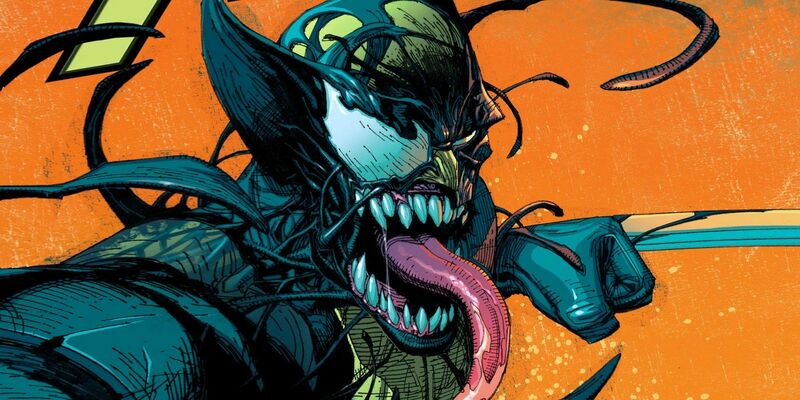 Eddie Brock may be the most famous version of Venom, but Marvel Comics has confirmed that Wolverine merged with the symbiote decades earlier. Its all part of the Web of Venom storyline taking place in the comics, with the mythology and history of the alien symbiotes on Earth being retconned, rewritten, and expanded. Recent comics saw Eddie Brock discover that the U.S. Army created symbiote soldiers back in the 1960s. Now, a more incredible twist has been revealed to fans in the first issue of Web of Venom: Ve’Nam. 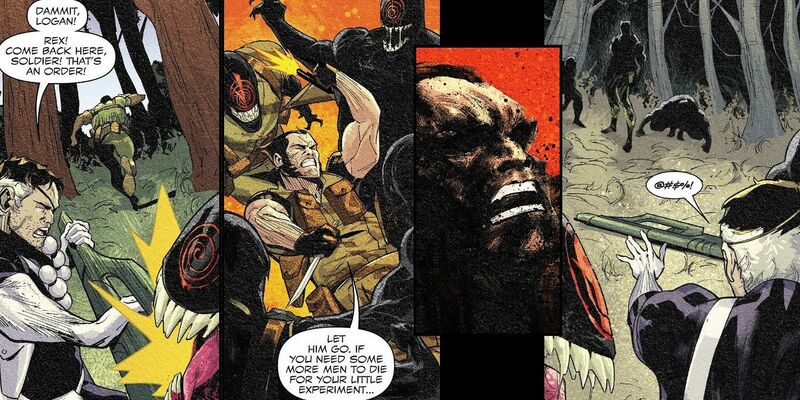 The alien symbiotes found more than violence in the jungles of the Vietnam War… they found the Wolverine. Having introduced the symbiote soldiers of the Vietnam War and their leader Rex Strickland to Eddie, the story potential was obviously too good to pass up. Ve’Nam is the comic to take advantage, jumping back half a century to show how Rex’s time with the alien symbiotes all began. And how it went completely off the rails when his unit took out the enemy as hoped – before consuming an entire company of American soldiers, too. The solution for Nick Fury, the man ordered to oversee the government’s second attempt to create super soldiers, is to call on the most un-killable mutant he knows to help track down these monsters he helped to create. While Logan shrugs off any sense of patriotic duty (reminding Fury that he’s Canadian) a pack of monsters killing soldiers is just the kind of mission he’s up for. Or was, back in the 1960s. Unfortunately, the symbiote soldiers prove to be more than Fury bargained for. The pair are stumbled upon by Rex, who has somehow separated from his symbiote. Which means the trio only have FOUR Xenomorph-esque symbiote soldiers to worry about… and one symbiote in need of a host. And fans of Venom and Marvel’s symbiotes know that four is more than enough to get any job done. The group are eventually overrun, with the host-less symbiote choosing extremely wisely of its three options. Making the day a whole lot worse for Nick Fury. The symbiote that merges with Wolverine is having a first contact experience of its own, since Logan is the first mutant inhabitant of Earth that any of the hive mind symbiotes have encountered. Is that the reason it adopts a hint of Logan’s pointed hairstyle even in merged, Venomized form? We may never know. What we do know is that when the symbiotes share their memories with Logan – memories of Fury’s scientists torturing the original symbiote these samples were taken from – it’s as much Wolverine leaping to attack Fury as it is the symbiote. That cooperation alone may hint at the first true, Venom-like partnership to have taken place on the modern Marvel universe. And when the symbiote is blasted off of Logan, and eventually returns to Rex, he notes a change: the symbiote now feels regret, fear, and rage. And when taking Wolverine by the throat, Rex and the symbiote speak the first human words yet: “Not… Animals…” To prove it, it he hurls Logan as far from the coming self-destruct explosion as possible, and guards Rex from its fiery detonation before disappearing. 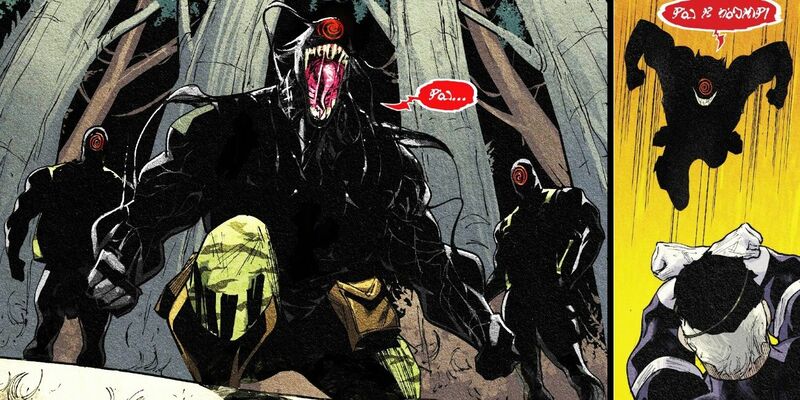 It seems the first step has been taken towards the eventual Venom, when the symbiote’s rage was shown to be Eddie’s influence, and casting the alien as the monster just an excuse. Either that, or merging with a mind like Logan showed the symbiotes that Earthlings torture more than just aliens. Nothing personal. Web of Venom: Ve’Nam #1 is available from Marvel Comics.